A dry mix wet-out marinade suitable for chicken wings, pieces. Gives a rich red colour with visual particulates. 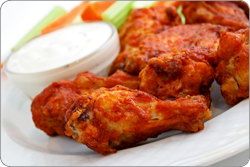 Use as a first step followed by Rupert’s Original Breading for Hot n’ Spicy Wings with a kick.